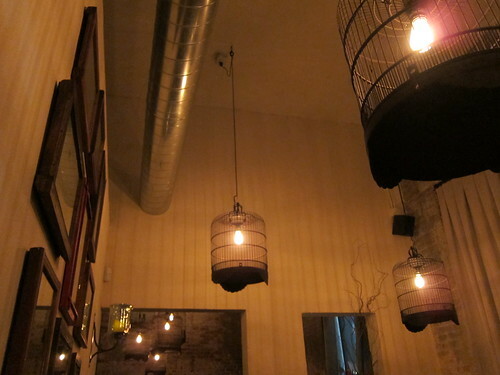 The Little Tokyo spot has a shrewdly stylish, if still minimal, ambiance with bird cage accents surrounding light bulbs incandescent. The front bar area seems like the perfect place at which to perch around the central wood-fired oven and enjoy a dish or two with the desired size pour of beer or glass of wine. I did wonder if the faces of those who sat at the bar, directly in front of the oven, were burning off or not (I caught a good amount of heat simply from walking by); then again, Downtown LA benefits from any spot proffering warmth to their customers, no matter how literal. Just choose your proximity, I guess, and they’ll just make sure to leave some brick exposedÂ so you’re reminded that you’re downtown and cozy. Though cost and variety was the reason were the reasons I chose suds (4 oz. beer pours are available for $2; glasses of wine are upwards of $14), light, cold and carbonated was, in retrospect, the perfect thing to wash down all those bold flavors. My Craftsman Hef was a great choice, and you’ll be glad to know that The Bruery’s Orchard White, Abita’s Amber Lager and North Coast’s La Merle Saison – and, true-to-form, the Singaporean Tiger Beer – are all available in 12- and 16-oz. pours as well. The starting lamb belly skewersÂ ($10), or satay, were singed perfectly while revealing fully flavorful, slightly gelatinousÂ centers. 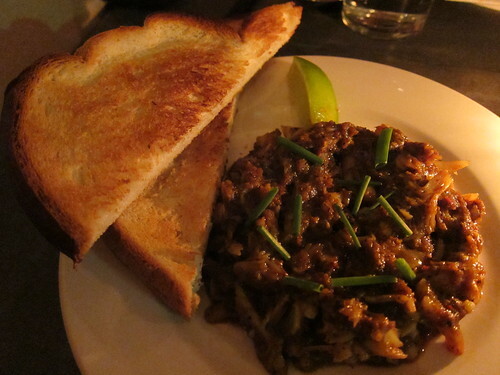 The piquant yet indulgent spread in the Black Pepper Crab Toast didn’t have me thinking that one piece of bread between the two of us wasn’t enough; I simply piled that crab paste onto my toasted triangle about an inch thick. We were almost to theÂ noodles, by then, but not before the squidÂ special came out. And though we sat in the dining room, this was where I fully appreciated that oven situated behind the bar. 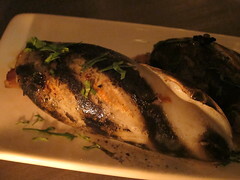 The deliciously charred, squid shell was not rubbery but as tender as its sticky rice center, with bits of familiarly rich Chinese sausage and just-as-meaty black mushrooms filling out the tubular vessels. The vinaigrette we spooned on top added the bitter-sweet note we didn’t even know was missing. You may end up wishing that this was a regular menu item. But then came our fiery hot noodles. 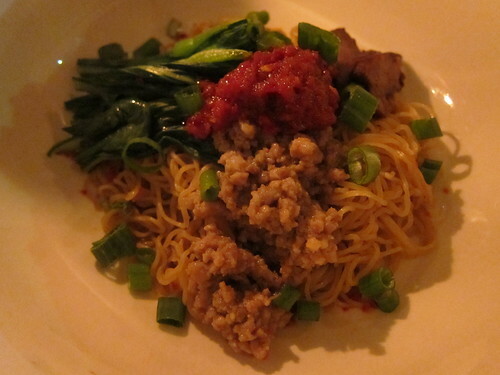 The first, the Kon Loh Mee, featured springy, thin egg noodles topped with ground pork, char siu (because one kind of pork is never enough), sambal and choy sum – the lattest of which were, I realized later, the only vegetables short of the garnishes we had consumed the entire night. The egg noodles were superbly cooked; I’m wondering if they were made in-house and regret that I didn’t ask. The entire dish, however, were some of the most punishingly delicious dry noodles I’ve had in some time. 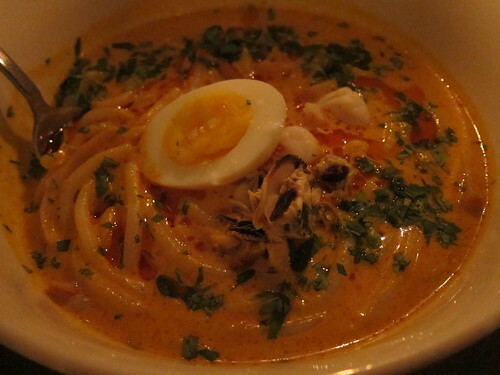 The Laksa, a coconut curry broth enveloping rice flour noodles, mussels and fish cakes and topped with coriander and a slice of soft-boiled egg, was almost as punishing. The creaminess of the coconut recanted some of that direct sting. It was enough of a break to entice us to press on, breathing in and out, while admiring that the restaurant didn’t pull any punches for The Stereotypicallly WeakÂ White Man’s Palate. (Or, gave our Stereotypically Tough AsianÂ Woman’s PalatesÂ their fair treatment – either way.) It even came with a hefty portion of sambal, which is allegedly traditional but something we had no intention of actually adding! The soup was thankfully delicious as it stood. I loved all the textures of the rice noodles and fish cakes while the mussels – let’s face it, I love shellfish – were that extra kick in the flavor pants. If they brought out the spicy dishes last for a reason, I have an inkling on what that reason is: Dessert. Our Kaffir Lime Custard wasÂ a refreshing, fluffyÂ yet tart reprieve. The perfect, thematicÂ ending to an adventurous meal by a former Mozza chef featuring Vietnamese and Singaporean flavors in a Japanese district calledÂ Little TokyoÂ in DowntownÂ Los Angeles. That is all. This entry was posted in beer, Downtown LA, Food, wine and tagged Asian, beer, Bryant Ng, chef, dining, Downtown LA, DTLA, L.A., Little Tokyo, los angeles, Singaporean, small plates, Spice Table, tapas, Vietnamese, wine. Bookmark the permalink.